I’m already starting to daydream about crossing a finish line on Hayward Field. You triathletes are all about the two-a-day, huh? I mean, I guess I figured that would happen a lot, but whoa. Going back to work after 10 days off was surprisingly not awful. Not that my job is awful, but I hadn’t seen pre-9am in, well, 10 days. So I didn’t have high hopes for what 5:30 am would look like after such a hiatus. But it wasn’t bad. I hope I don’t have to run any 20-milers on a treadmill. Hurry, spring. I LOVE my new bike. I barely know what it’s capable of and the seat is insanely uncomfortable right now, but I love it. It only took 60 minutes on said new bike to convince me to invest in some high-quality bike shorts. My current pair of purple shoes (the Asics Nimbus 11) have 344 miles on them. I read somewhere it can take 400-600 miles for a bike to feel “comfortable.” Relief. I thought I just sucked. I really, really liked Avatar. And that’s not usually my type of movie at all. But wow. Running outside is at least 8,000x more fun than running on a treadmill. At least. My knee is STILL all bruised from wiping out at the Polar Dash. Klutz. I love those Visa Go World commercials. I’m no longer afraid to hit the pool. I just know it won’t be easy. Hope Monday wasn’t too rough on you. Happy running. Boo to treadmills. I just ran my first marathon on a treadmill (was supposed to run Disney over the weekend but had to cancel trip). But I still wanted to run it. NEVER AGAIN! can enter to win this gift and more by entering our 2011 Holiday Gift Guide Giveaway! You can also enter to win even more aewmose toys here at the 12 Days of Christmas Giveaway! Sweet bike – I’m wanting to get a carbon fiber bicycle very badly. 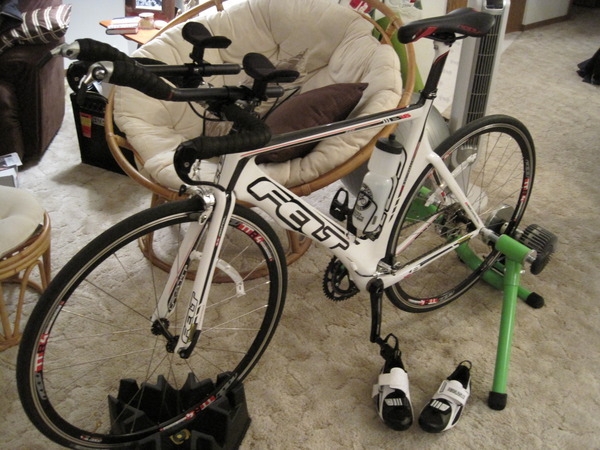 Does riding something beautiful on an indoor trainer help inspire you? Or are you just biding time until it warms up outside? The trainer is definitely my only option right now (other than spin classes) as there’s all sorts of snow on the ground (and there probably will be until April…I’m in South Dakota!) Definitely eager to get her outside!